“Damn Mark, try to miss a few, would ya!” Ellen rubbed at the elbow that had slammed into one of the cupboards in the back of the old ice cream truck. The suspension was completely shot, and every bump or pothole Mark hit bounced Ellen around the back like a pinball. It didn’t help that the roads down to the shanty town weren’t a priority for maintenance, so there were more holes than pavement. “Nearly there, Ellen. Just hang on!” Mark called back in his perpetually cheerful voice. When the truck finally rumbled to a stop, she couldn’t wait to pop open the door and jump out. The sad little cluster of makeshift houses had grown since they’d been there last. The area was a patchwork quilt of materials—everything from sheets, to cardboard, to scavenged wood and metal had been pressed into service. Ellen reached back into the closest cupboard to pull out her immunization kit. New houses meant new residents, and they’d need to be inoculated. When she turned around again, she caught sight of several wary faces peering at her through cracks in temporary walls. Mark was more popular. He’d be handing out food and water vouchers from the window that had, once upon a time, been used to dole out ice cream to excited children. “I’m gonna hit the new places. See ya in a bit,” Ellen waved back at Mark and got an absent wave in return. She checked to make sure the batteries in her radio were fresh, and then turned down one of the narrow alleys. She’d learned how to knock on doors that didn’t exist, scratching at a sheet or strip of fabric, rattling a curtain of cans, or flicking a finger on a sheet of corrugated metal. The occupants appeared reluctantly, if at all. After several stops, she hadn’t managed to immunize a single resident. That wasn’t unusual—the people living here looked at government-sponsored healthcare with distrust, at best. What was unusual was the lack of children. A feeling of unease followed her between the eerily silent homes. Coming around a house made entirely of cardboard, Ellen stopped and stared at the structure in front of her. She pulled the radio out, and fumbled for the call button. She heard his shoes slapping against the dirt a few minutes later, and then he was standing next to her, gaping. It was larger than any other structure in the shanty town, and it boasted a collection of wood and metal walls. There was a makeshift fence surrounding what looked like a play yard filled with children and old toys. But what had captured Ellen and Mark was the roof. 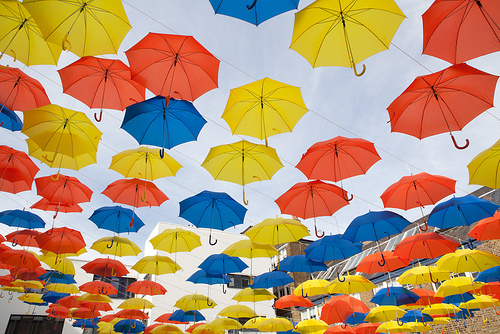 Umbrella after umbrella, in every color and style imaginable, had been overlapped to create a colorful cover for the building. “It’s a school,” Ellen whispered. Image courtesy of treborwilson via Flickr CC2.0. Click image for source. This post is my response to a prompt from Write On Edge to write a 500-word short story using the picture above as a prompt. I was sorely tempted to write a piece from the novel I'm planning for Nanowrimo (Mary Poppins & The Zombie Apocalypse), but I resisted! Thank you for taking the time to read my story, and please let me know what you think in the comments! This was a wonderful, interesting, compelling piece!!! I love that you used umbrellas as the roof,and the hope that seeing the school inspired..I could hear your character's reverent, shocked whisper at the end. Thank you Jenna! I was really praying that sense of hope would come through! I really liked this. The image of umbrellas being used for a roof was just wonderful. I also loved that it was done for a school. Children are the epitome of lively color! Very cool! I enjoyed the "twist" - I was expecting something much more dire, but it was such a hopeful ending! :) A colorful school... how ideal! Good luck with your Nanowrimo... it sounds awesome. Thank you, and thank you for the good luck! Ooh! Didn't see that coming. I was afraid you were going dark and depression again... I loved this twist! Beautifully done . . . you really set the scene to show desperation and then end on hope. Lovely. Also, I enjoyed the section about knocking on doors that weren't there. Thank you! Amybeth (above) is right - I tend toward the dark and depressing sometimes, so it's nice to have a hopeful one here and there! Wonderful. Was a little worried about the ending, but it was perfect. I was trying for a feeling of suspense and foreboding, and trying desperately not to give away the ending! Thanks! I love where the umbrellas are taking everyone! This was great, hope and humor against the darkness! Hope and humor are our best defenses against the darkness! And chocolate, but I don't really like chocolate (I know, my woman card would've been revoked years ago if I hadn't breastfed my boys).